He is the scourge of Stupid White Men everywhere. He's taken on fat cats, gun nuts, lying politicians. The Guardian describes him as 'a wake-up call, a kick in the mental backside.' 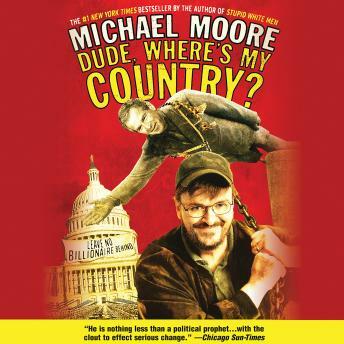 And now, Michael Moore is back, daring to ask the most urgent question of these perilous times: Dude, Where's My Country?Michael Moore is on a mission in his new book: Regime Change. The man who slithered into the White House on tracks greased by his daddy's oil buddies is one of the many targets in Mike's blistering follow-up to his smash #1 Stupid White Men, the biggest selling nonfiction book of the year. Now no one is safe: corporate barons who have bilked millions out of their employees' lifetime savings, legislators who have stripped away our civil liberties in the name of 'homeland security,' and even that right-wing brother-in-law of yours (yes, we all have one) who manages, year after year, through his babbling idiocy, to ruin Thanksgiving dinner.Fearless, funny and furious, Michael Moore's new book is the call to arms we've all been waiting for, the kind of book that comes along once every so often that rallies citizens with humor and insight, and changes the course of the country.